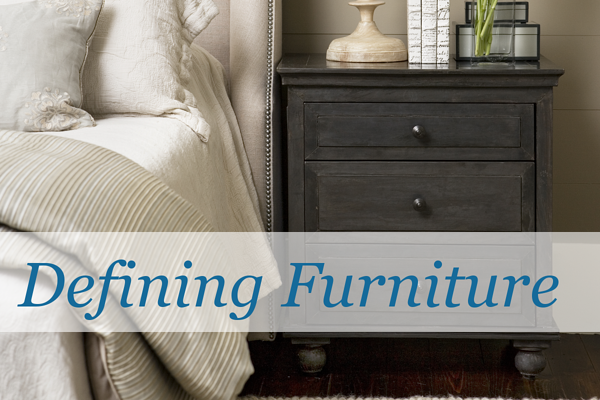 An easy place to start understanding the nuances of furniture is right next to the bed. The terms nightstand and bedside table are often used interchangeably. Both are pieces of furniture that sit next to your bed's headboard and typically hold a lamp. The difference between the two is that nightstands have shelving or drawers, below the table-like surface that makes up a bedside table. These drawers are an ideal way to store nighttime items that you'd prefer remain private or out of the way during the day. 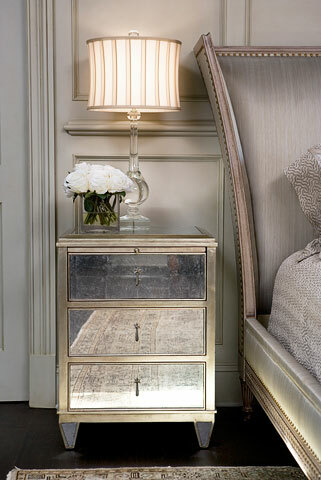 When nightstands have three or four drawers stacked on top of each other, like the one below, they can also be referred to as a chest of drawers or bedside chest. When you are short on closet space and are looking for someplace to store the majority of your clothes, a designer might recommend pieces like the wardrobe or chifferobe. But what is the difference? Wardrobes are the tall, typically two doored pieces designed to hold hanging clothes. These pieces are sometimes referred to as armoires when they have ornate woodworking on the front and a drawer or two along the bottom. Chifferobes, on the other hand, are typically a bit smaller and combine a smaller portion of hanging space with many drawers. These make the chifferobe a better option for your storage needs if you prefer to condense all of your clothing storage into one piece of furniture. Wardrobes, like the one below, are a better option if you need to store a lot of hanging items and already have enough drawers for storing your non-hanging clothes. Pieces like these are not only useful, but can serve as tasteful decoration in the space. 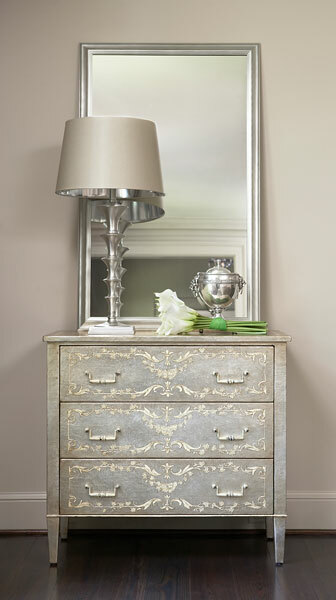 Also known as a dressing table, a dresser is the traditional drawer based container for your clothes. They frequently include an attached mirror for putting together your outfits. Vanities are fairly similar, but they go one step further and include a space for your legs so that you can sit down and put on accessories and apply makeup. Because of the decreased storage space and the emphasis on accessories, vanities aren't most people's go to source for clothing storage. As many women apply makeup at their bathroom vanity, a different piece of furniture that includes a sink and no sitting area, the traditional vanity has become less common. 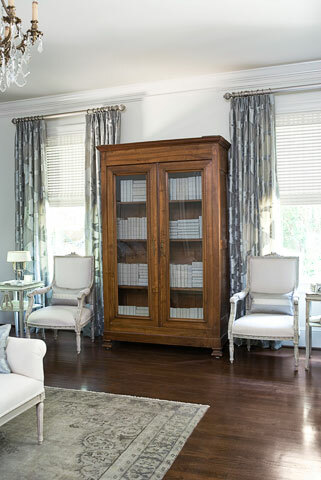 Finally, its fairly common knowledge that a classic bookcase consists of open shelves or shelves visible through glass doors. These are often used to store display decor, most commonly books. Trying to understand what a hutch is takes a little more effort. A hutch is a set of shelves or cabinets placed on top of a lower unit with a counter and either drawers or cabinets. This very inclusive description can make it hard to determine if a piece with open shelving interrupted by drawers below is a bookcase or hutch. The key to figuring this out is the counterspace. Bookcases lack the counterspace aspect found in hutches. Both are a beautiful addition to a room and provide an excellent display space, but hutches are more frequently used to display fine china in dining rooms and bookcases are more common in studies. We hope this post makes you feel a little more confident when discussing furniture for your home. If you're interested in learning more, check out more descriptions here. What pieces of furniture are you unsure about? Want help figuring out where some of these large pieces will go? Try our space planning guide for tips.